While his elementary school peers study the violin or clarinet, Brandan Duke is finding his musical talent in scratching and blending beats. The nine-year-old is studying the art of DJing, a form of electronic music performance usually restricted to the nightclub crowd. But age doesn’t let Brandan stop him from doing what he loves. At a very young age, Brandan, who goes by the stage name Dextrous One, starting playing around with his dad’s turntables. “I was just fooling around, I didn’t know what I was doing,” Brandan said. His father, Ryan Duke, says his son tried to emulate other DJs. Brandan’s instructor Francis Felice says he’s a natural. “I would say that he’s probably better than a lot of the adult DJs that I come into contact with,” Felice told CTV News. When he performs, Brandan wears a “@6” on his shirt because at age 6, he played a nightclub in Toronto. It’s a feat acknowledged by the Guinness Book of World Records. “The record that I currently hold is for the world’s youngest DJ,” Brandan said. It’s also a moment his father remembers well. Brandan’s personal favourite so far? A version of Canada’s national anthem that he remixed at age 7. Brandan currently takes DJ lessons after school. 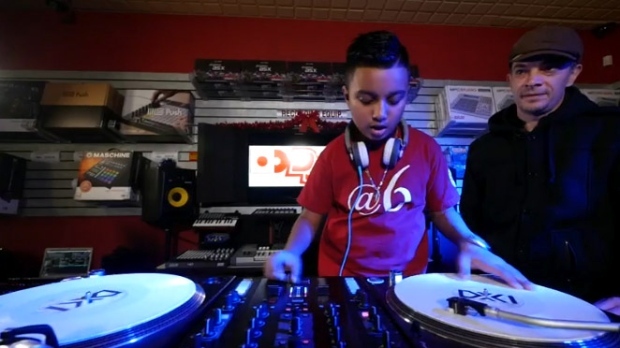 But when he gets older, Brandan also plans to pass on what he has learned to the next generation of DJs.